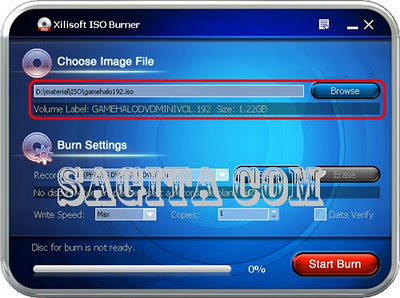 SAGITA COM - Xilisoft ISO Burner adalah software untuk membakar ISO ke CD, membakar ISO ke DVD, termasuk data ISO, film ISO, dan file gambar bootable ISO ke CD-R, CD-RW, DVD-R, DVD + R, DVD-RW, DVD + RW, DVD + R DL. Xilisoft ISO Burner juga bisa membakar file gambar dari semua format lain, seperti BIN / CUE, IMG, MDF, NRG, CDI, B5i, B6i, dan DMG. · With the ISO burner, you can fast burn data ISO, video/audio ISO, and operating system ISO files to CD/DVD. · The ISO burner also can burn all other image files including BIN/CUE, IMG, MDF, NRG, CDI, B5i, B6i, and DMG. · You can burn ISO files to CD-R, CD-RW, DVD-R, DVD+R, DVD-RW, DVD+RW, DVD+R DL, etc. · This ISO burner will burn disc at the highest speed of burner and disc supported to save your time. · Just drag ISO file in, insert a disc, and start to burn ISO files, then you will get the ready CD or DVD. · If you insert a RW disc with data, the ISO burner will prompt you and erase the content if you want. · After burn done, provide data verification to compare ultimate disc with the source file to verify if the disc data is complete and correct. · Allow you to set speed to burn ISO files according to your will and copy number if you want to burn multiple disc copies. · Display burn rate of the progress and provide passed and remaining time of the ISO burning for your reference. · The ISO burner will check for update automatically and prompt you the new version to ensure you own the latest features. · You can choose the after burn done action before burn ISO or other files, and let the PC execute your preset command after burn finished. · The ISO burner provides English, German, Chinese, Japanese languages for you to choose.